Hi guys! Long time no see 🙂 I hope your 2018 is off to a great start! I know I’ve been badly MIA and I apologize for that…I’m working on a longer post to come about what I’ve been up to (in case anyone is still reading here:). 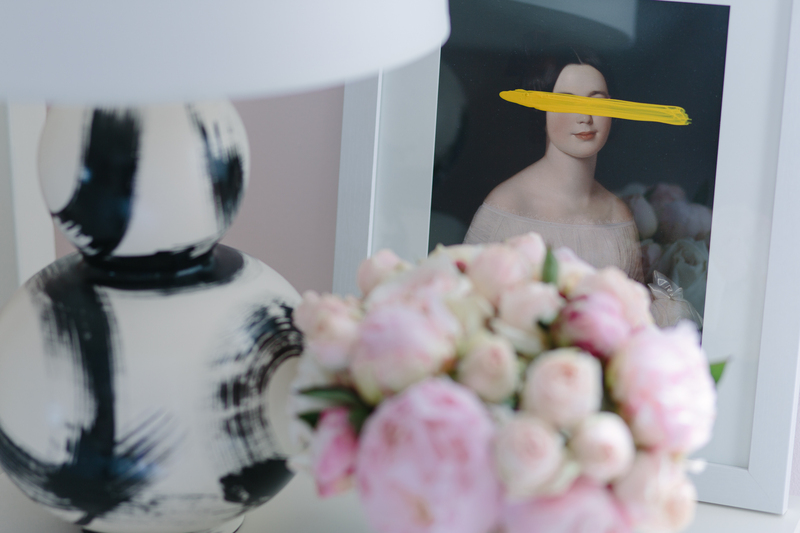 Today I’m excited to show you a peek at some of the progress I’ve made in the bedroom of my new apartment. Decorating the bedroom has been a bit of a struggle for some reason (more on that later), but one of the first things I did was buy nightstands. 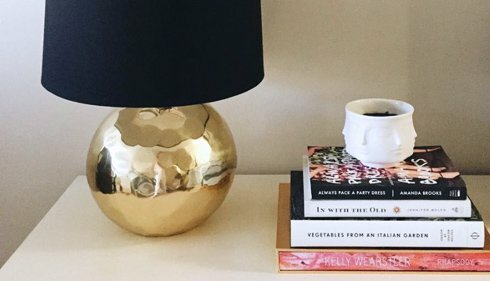 I’ve literally never had actual nightstands in my life (I had a dresser next to my bed growing up), so this was quite exciting for me from a decorating standpoint! Actually it’s funny because now that I have them I’m like, what am I supposed to put on them (haha). Anyway I looked and looked and surprisingly didn’t find that many options that I loved (that weren’t crazy expensive), but I wound up going with the Clara Lattice 1-Drawer Bedside Table from Pottery Barn, and I was able to get them on sale, happily. They’re a bit generic looking but I think the lattice sides add a bit of personality. My next plan is to switch out the drawer knob for something more fun, either brass or maybe something colorful. 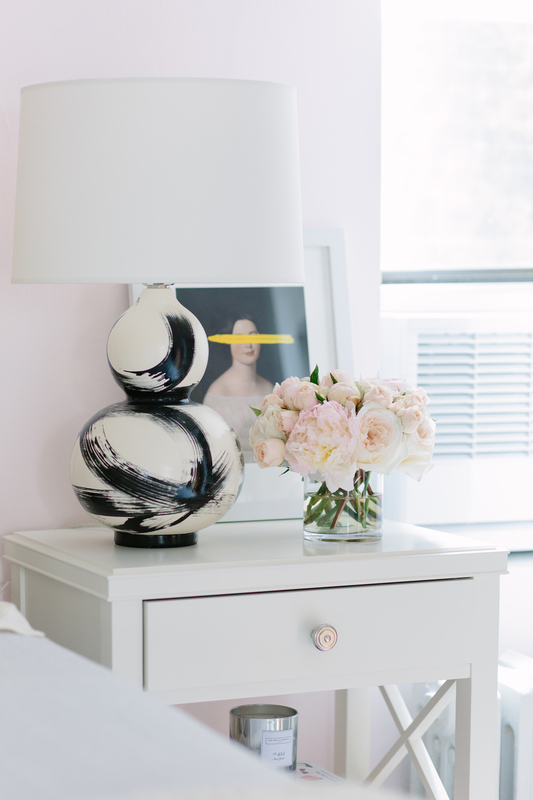 Actually I retract my earlier statement – the actual first thing I bought for the apartment – the Jana Bek Brushstroke lamps. I’ve been obsessed with them forever and never had a spot for them in my last apartment. Now more space = more space for lighting! I love black and pink so I’m thrilled with how these look against the walls, which are painted Farrow and Ball’s Middleton Pink. And how pretty are these floral arrangements from my friends at B. Floral? They certainly injected a much-needed dose of color and life into the winter doldrums! Last but not least, I propped my Josh Young Design House Emma print up and I think it looks quite fetching! 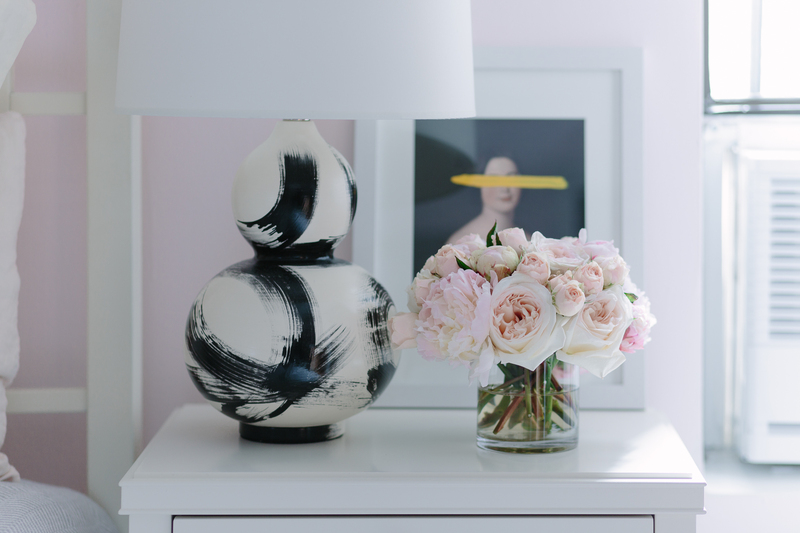 I like the look of leaning art – it lends a casual vibe and creates a nice layered look. Can’t wait to share more bedroom updates with you soon, including my new headboard and the many furniture layout iterations I vacillated between before finally settling on what I think is the right one. More to come and thanks for reading! I like the choices you made, Jackie. I am curious to see what the other corners of the bedroom look like. I LOVE everything I’m seeing Jackie! That wall color, the Jana Bek lamp, pops of black, bedding and mood! Oh, and your gorgeous photos!! LOVE IT!!!!! Can’t wait to see more. The pink walls, the lamps and Emma are my faves! Yay I’m so glad! I’m happy with the pink walls too even though they took a little getting used to! It looks gorgeous! I now need that lamp and the color of the walls is just beautiful. Thanks Diana! I tried a few different paints but I think Farrow and Ball is just the best…plus they have a limited selection which actually helps for indecisive people like myself! Your space looks so so good!! I love the throw pillow on your bed. Is it still available somewhere? Thank you Jess! The pillow is Albert Hadley’s Fireworks pattern. I bought it from Society Social…she no longer has it available but if you reach out to a designer they can get the fabric for you and then it can be made into a pillow cover by a seamstress. It also comes as wallpaper which I LOVE. Jackie, this looks amazing!! I feel like I need to order that print now… Can’t wait to see the rest of your new place! 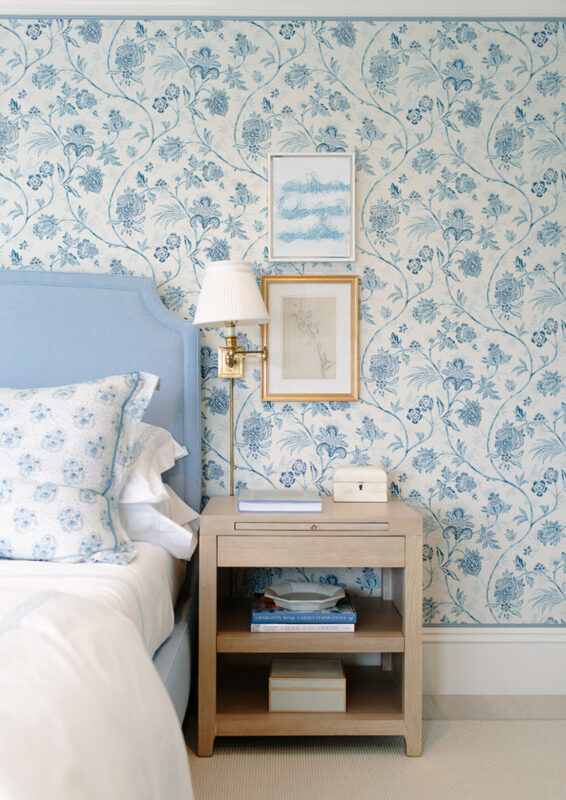 Love the simple white headboard! 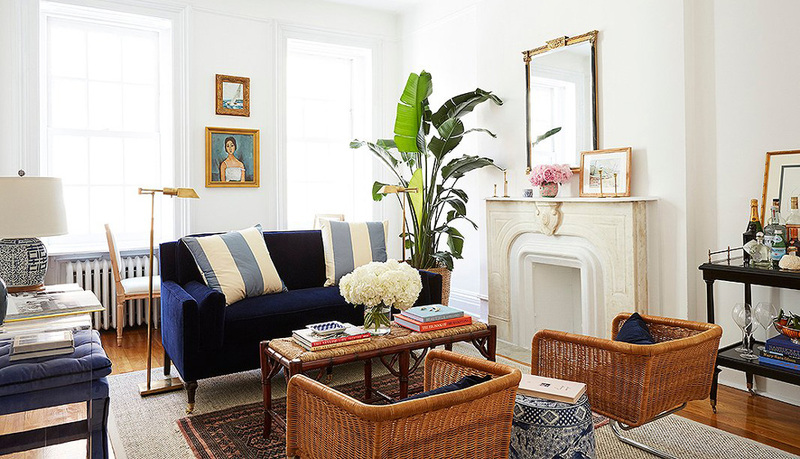 Such a pretty room and I adore that print you had framed. Those lamps are to die for!!! 😍😍😍 You’ve created such a beautiful space! Love the artwork on the night stand! 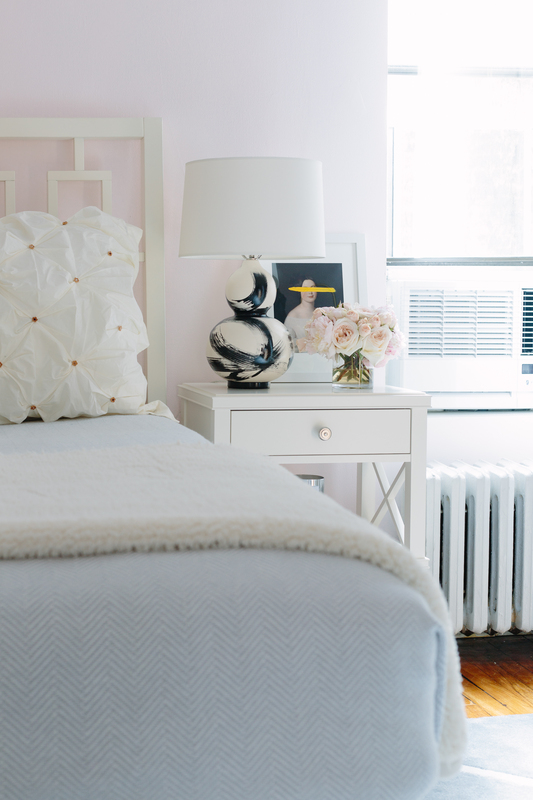 Your bedroom looks feminine and grown up, so pretty! Jackie, Thanks for the sneak peak. Love the wall color. Everything looks so beautiful. Masterpiece in the making! It is looking great. Love those lamps. 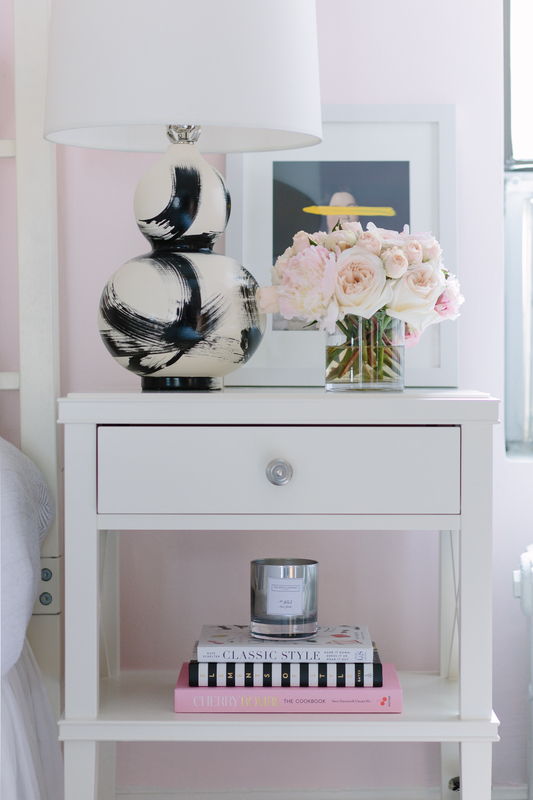 And, you can never have too many peonies – pink at that. Love, love, love it!